Many people in this day and age are limited on their time to get some exercise on a regular basis. But that is no excuse for not giving your body what it needs to function well as you age. We are going to briefly discuss the importance of exercising and a good way to get it in with your everyday life. Thus, making time for exercise when there is no time. Exercise is a thing that helps your body function like a well-oiled machine. It increases your blood flow which improves oxygen-rich blood to extremities. This means your heart your bodies muscles and arteries will benefit from your exercising. It also promotes cell growth and organ function. This means your body will be rejuvenating itself well as it was designed to do. For example, your skin health as well internal organs will stay healthier. You will feel better and function better as the result of taking the time to put in some sort of physical workout. If you never considered cycling, this is a good reason to start. If you like to keep your body feeling good and functioning good, then you know you must get some sort of exercise to accomplish that goal. Cycling is a good way to get your exercise with low impact to the body as well as increasing strength in the process which is a plus for us over 40 years of age. Cycling actually promotes health. It reduces the risk of obesity, high blood pressure, high cholesterol, diabetes & cardiovascular disease. This is done whether you are cycling for exercise or transportation. I guess you can see what I am getting at by exercising without planning to. You have to go to work every day. You also make those short drives to the store for things. You may have kids who would love to ride with you from time to time. Why not use this time to get some exercise and kill two birds with one stone? Using your bike to ride to work every day is a great way to squeeze in some exercise without planning it. When it comes to riding to work, you are doing what you must do and it is giving you exercise 5 to 6 days a week in the process. Whether you are doing what you do normally or hanging out with your kids or running to the store, you are exercising without planning to. It is much easier than trying to keep up with a scheduled routine like going to the gym when you really don’t have the time. Doesn’t that sound like an easy way to get daily exercise? Nordick Research & MIT Press has provided information on cycling through many articles. There are a couple of studies I ran across to substantiate that bike riding is a great way to get in much-needed exercise for the human body. In a Danish study, they took 53,000 Danes aged 50 to 65 and monitored them for 20 years. The researchers registered the number of instances of cardiovascular disease amongst the participants in that time frame. They found that those who were already actively cycling around 1 hour a week prior to the beginning of the study had an 11% to 18% chance of less likely to develop heart disease. They also found that the ones who just started cycling at the beginning of the study were 26% less likely to develop heart disease than those who don’t cycle. 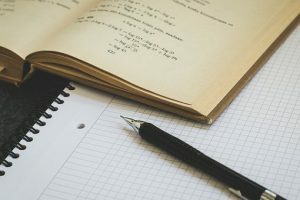 The Swedish in their study took 23,000 Swedes with the average age of 43.5 for 10 years and found that those who cycle had a 39% lower risk of becoming obese, 11 % less chance of having high blood pressure, 20 % less chance of high cholesterol and an 18% less chance of developing pre-diabetes. I myself can attest to the obesity thing. 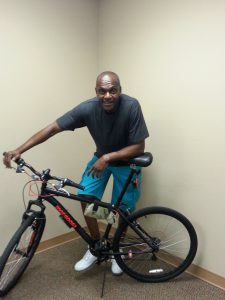 I am 57 years of age and I ride to and from work for a total of 7 to 12 miles a day depending if I detour off from going to or from work. And I am 6’4 and weigh 185 lbs. And I have been doing this for about 3 years now. And I feel wonderful! So you can see it would benefit anyone who gets any kind of exercise regularly to keep your body fine-tuned as we go through our lives. Cycling allows you to incorporate exercise in with your regular activities. Thus, making time to fit it in without planning it. Thanks for visiting and if you don’t have a bike, it is time to purchase one and give it a go. 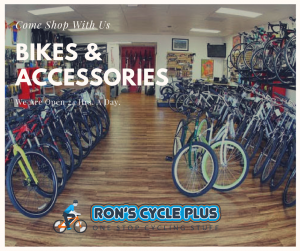 You can pick up your bike here at Ron’s Cycle Plus at the top right of this site. I wish you good health. And Keep On Pedaling! How right you are, a little exercise every day does so much. The idea with the bicycle is great, as there are so many opportunities to ride a bike. Thanks, I try to encourage people to utilize the bicycle because it is a way to put some exercise in your life and have fun with it as well. And because it is a mode of transportation, using it as such will give you the exercise without even thinking about it. It is better than routine exercise because a lot of people get bored and stop. This way you will have a better chance of it not becoming so redundant. Interesting article. I have recently had two stents in my heart and have been wanting to exercise more and lose weight. Unfortunately, I gave my bike away about a year ago because I never used it. I am always away from home with my job and have been trying to walk as often as I can. I am a larger person over 115kgs, is there a foldaway type bike, I can put in the trunk of the car available? Yes, riding would most definitely benefit you. You will have to figure in a way where riding would be a natural thing so it won’t feel like a chore. There are folding bikes available. There is one called the Morphon folding mountain bike that would be perfect at a reasonable price.You can view it at Ron’s Cycle Plus here on this site. Great information! I used to cycle when I was younger but got away from it as I got older. I need to get back into cycling and ride the bike path that’s near my home. Thanks again for the information! No Problem. I will tell you this. If you jump back on, your old passion for the ride will kick right back in. I think the body never forgets the relationship it has with cycling. Thanks for visiting and give it a whirl. It’s been a long time since I rode my last bike. To be honest outdoor cycling is more popular with my male friends. They practice it frequently. With the girls spinning is as close to cycling as we come lately. Even though it’s not the same I think it still helps. Spinning is a great way to exercise. Some people don’t have it in them to consistently go to a gym or workout facility. They usually will drop out at some point and maybe start up again later. But if you ladies love doing it I can see you as a group never getting bored. Very good Dira. Keep On Pedaling. Quite interesting! I have considered cycling as a form of exercise but only as an organised sport. However, this perspective is refreshing. I could incorporate cycling into my regular schedule. In some cases, instead of using the car, I can use my bike and it would help me much more on my health journey. Guess I have to go and dust off my bike now, huh? Thanks for this post! You won’t be disappointed in fact, glad you did. Just think of the gas you will save as a perk. I hope you get out and enjoy being outdoors and riding in your area. You will soon start to turn to your bike as much as you possibly can. Keep dropping in from time to time as I share more good biking news. Thanks for stopping in.